Come hell or high “eau vivre” (water of life) as the saying and loose translation of its name goes, this year I’m going to experience the elegant small batch French-style wines of Eau Vivre Winery on site at the family-run boutique winery in the heart of the Similkameen Valley. Recently Winemaker Anthony Buchanan joined the team so when I heard he would be pouring in Penticton at the BC VQA Wine Information Centre, February 23, I thought it’d be a great chance to meet him, too. With a distinguished last name like Buchanan despite we are not direct relatives to my knowledge, I figured he’d be an interesting fellow. Oh, yes, and his credentials look pretty impressive, too. I headed into the store to learn Anthony was under the weather and unable to make it that day. I did get to reconnect with Dale again, taste some lovely wine and buy a couple of bottles. It is yet another incentive to hit the road soon and venture into the gorgeous Similkameen. Added to that, Dale, invited me for a barrel sample and I know there’ll be “yummy wine waiting” as he promised! Always a smile to greet tasters. I was particularly enamoured with the big, new Bordeaux-style blend – the Buddhafull. I’ve always enjoyed the Pinot Noir and the 2009 won the prestigious Lieutenant Governor’s Award in 2012. Given Eau Vivre opened in 2008 that’s a rather impressive accomplishment in such a short time. In the Canadian Wine Awards 2010, the Pinot Noir 2007 received a Bronze. Also to be enjoyed are Gewürztraminer, Riesling, Chardonnay and Cabernet Franc. So, if you’re heading to the Wine Bloggers Conference 2013 from the Oroville/Osoyoos border crossing, consider taking the route through the Similkameen either coming to or returning home. Eau Vivre is a proud member of the Similkameen Wineries Association and this route will introduce you to the wineries and area dubbed by enRoute Magazine as “one of the world’s best wine regions you’ve never heard of”. 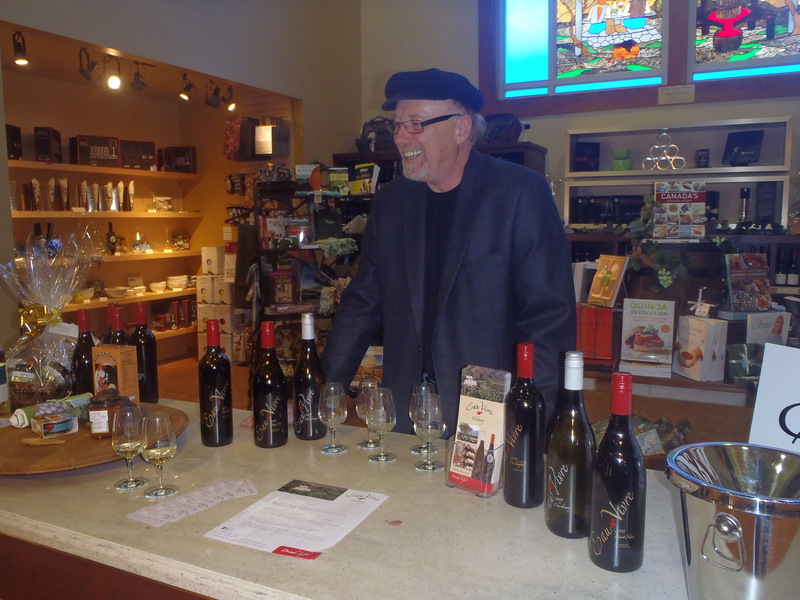 As for me, I’ll get to Eau Vivre Winery in due course and for now, will continue picking it up at the Penticton BC VQA Wine Information Centre or one of the other locations listed on its website. p.s. The Eau Vivre Winery website has lovely photos enticing us to make the trek. And I’ll update this post once I’ve been there in person. This entry was posted in Alcohol, BC Wineries, BC Winery Each Week, Beverages, Family, Joy, Lifestyle, Travel, Wine and tagged #wbc13, BC tourism, BC VQA, BC wine, British Columbia, Canada, Cawston, Eau Vivre Winery, Okanagan, Penticton, Similkameen Wineries Association, travel, wine, Wine Bloggers Conference, wineries. Bookmark the permalink. There are so many wineries to explore. They are popping up like pop up restaurants. I m alwys hearing about something new. Yes, it’s exciting that there are so many great places to explore!